Through some strange set of circumstances I’ve found myself walking past Atiwhakatu Hut in the Tararuas on 5 separate days of 3 weekends in the past 6 weeks. None of it was very planned in advance, but it happened to correlate with the hut’s replacement, giving me an opportunity to take some photos of its evolution, and the eventual destruction of the old hut. The new Atiwhakatu Hut is the same design as Roaring Stag, and although I haven’t had an opportunity to see inside, it looks great from the outside. No doubt people involved have their own much more complete sets of photos, but I’m quite chuffed to have my own. 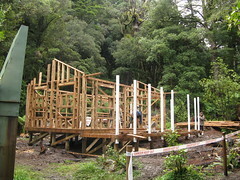 This is the first time I’ve had an opportunity to watch a hut being built in this way. There’s not much to look at yet, but trees have been cleared and there’s a floor. Lots happened overnight, and now it’s starting to take shape. 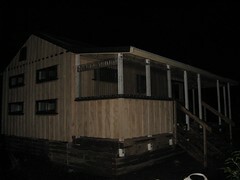 It’s finally starting to look like a real hut, and the whole Roaring Stag thing is becoming clearer with the deck going around the corner and such. If there wasn’t still a construction site around it, we might have quite easily walked up and taken this as a fully completed hut. 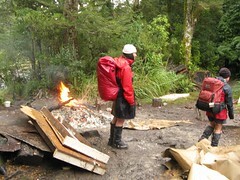 The builders were strumming away on a guitar with the fire going in the old hut as we walked past. 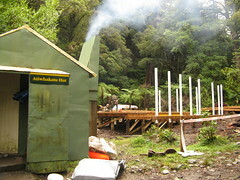 I’m sure the old NZFS Atiwhakatu Hut will inspire memories for many people, probably including memories of a smoke-filled room. 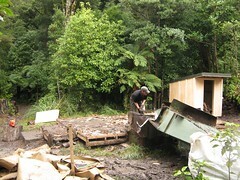 By 31st May, the builders had deemed it time to dismantle the old hut, presumably moving themselves into the new hut whilst completing the final touches. We happened to walk past during this phase, which involved a very hot bonfire. Almost a year after its completion, I finally walked past Atiwhakatu Hut again to see it complete, and about to be packed past overflowing later in the evening. 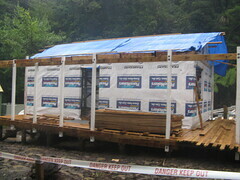 It must be an interesting and unusual project to be involved in building a back-country hut like this. 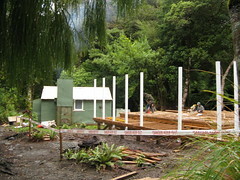 One of the guys there told us that as Atiwhakatu Hut is near the Holdsworth road, they were spending about seven to eight days on the job at a time, then getting a break. 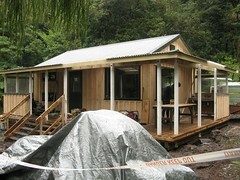 When he was working on Maungahuka Hut near the Tararua Peaks, though, he spent a solid month up there. 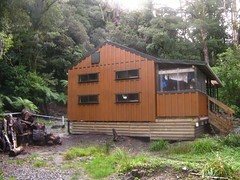 This entry was posted in musing and tagged department of conservation, musing, tararuas. Bookmark the permalink. Excellent job in documenting the progress and effort, could become of historical value someday! The closest I came to this was arriving at Parks Peak to find a new hut there in place of the rather “quaint” old one. I recently spent a few nights there with a few hunters who had come upon it during the building process which was interesting to hear. Apparently the builders can be very “colourful” characters. 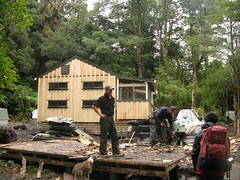 The hut seems pretty sound though, and Atiwhakatu looks like it was in pretty capable hands as well. Thanks Robb. Yeah, it was a really fascinating process. I knew the hut was being replaced but I’d made no plans beforehand to go anywhere near it at all, and I guess I just got lucky. I do feel bad seeing some of the old relics disappear (bye bye to another old NZFS hut), but I suppose it’s a sign of the times as far as the current needs of that particular place, and 20-30 years from now, the new hut will have its own historic significance. 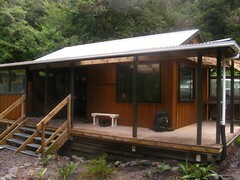 and why it isn’t the same size as Totara Flats hut. It would be ideal for school groups. Powell Hut would probably put off beginners for life. I’m sure the reasons are minuted somewhere and you could probably ask DOC and they’d be happy to explain. I wonder if perhaps they didn’t want another serviced hut (3 tickets each) in the same vicinity, which take more time and money to maintain, and would cost people more than it used to for a short under-trees walk. For hut fees, Jumbo and Powell on that same circuit are responsible for some huge proportion of the money from the Tararuas (80% maybe), at least according to a chap I met a few weeks ago. Add Atiwhakatu to that and the circuit (well, the whole road-end) gets very expensive for any group wanting to aim for huts but keep the costs down. That’s just my guess without having thought much about it.